The tone poem is muted, but the colored lights and the blinking strobe on the dome make the house hard to miss, which is exactly as the owner wishes. For this is a tale more Gatsbyesque than intergalactic, although the blinking light in this case is not green or at the end of a pier, but lavender and announcing itself to the beloved and the cosmos. The story of a home 40 years in the making, however, is not one to be rushed, so let us begin by introducing the protagonist, who hails, of course, from a distant land: the city of Ponce, 20 minutes down the road. His name is Roberto Sanchez Rivera, and he is 58, a retired teacher of industrial arts. As the reporter does not speak Mr. Rivera’s native tongue, his girlfriend, Maria Martinez, a 56-year-old secretary at the Internal Revenue office in Isabela, who grew up in New York and has been seeing Mr. Rivera for two years, agrees to translate. Those light fixtures, which Mr. Rivera added a few months ago at the base of the house, what are they made of? He is simply a creative man, Ms. Martinez insists. Back in high school, he decided that one day he would build a house that was unlike any other. And after getting a degree in fine arts and studying industrial design, he had the ability to do that. Mr. Rivera, who has the soul of an artist, bought the property where his house stands for $95,000 in 2002 and was able to build a three-bedroom, two-bathroom home on it for about $150,000, using discount-store knickknacks and discarded auto parts. “Repurposed” is too weak a word to do justice to his ingenuity when confronted with a scrap of tin. Those metallic boxes on the flying saucer’s dome, which suggest a sophisticated communications system or perhaps a weapon that could smash our sorry planet into smithereens? Ashtrays from the dollar store (Mr. Rivera used about 200). Many of the sculptural light fixtures are made from car parts. The living room shades were once seat belts, and the fountain in the dining room is made from old utensils and pots and pans. Mr. Rivera also built the furniture, most of which is mounted on the wall a few inches off the floor. He grew up in the barrio, he explains, and there were a lot of insects. Plus, having furniture a few inches off the floor makes it easier to clean the house. He built the cabinets and closets as well. And the toilet seat that serves as the base for the overhead lighting in the master bedroom? His design. It echoes the toilet, Ms. Martinez explains. In the guest bathroom, the ceiling is made from bath towels, pulled taut and shellacked. There is also an arresting painting by Mr. Rivera that shows an older man with his arm around a young man’s shoulder and, in the background, a long-haired woman who has turned away. The young man has a prominent tear running down his cheek. Ah, yes, the 40-year-old cuts to the heart are the ones that hang you up the most. Mr. Rivera was a poor child, one of 12, whose father was the superintendent of a sugar cane mill, Ms. Martinez continues. When he was in high school, he went on a field trip and saw a house being built in the shape of a boat, which made a big impression on him. This was an era when there was much talk of U.F.O.’s, or as they’re called here, O.V.N.I.’s, for Objeto Volador No Identificado. The woman in the painting, whom Mr. Rivera declines to name, went to high school with him, and he sent her little love notes with pictures of flying saucers, promising that one day he would build a house shaped like that. Later, when they were studying at the Pontifical Catholic University in Ponce, Mr. Rivera and the young woman started going out. So that’s why he bought this piece of property, which can be seen from the road? “Es y so!” Mr. Rivera puts in. This is so. Ms. Martinez seems very calm translating all of this, she is told. Doesn’t it make her jealous? “Yes,” she says, it cuts her up inside. But Mr. Rivera no longer has feelings for the woman. The last time he saw her was four years ago, Ms. Martinez says, resuming her translation. He had been married, had two children and was divorced by then. She called him and he invited her to come see the house. It was in its first stage — a house in the shape of an octagon — but still, the woman was impressed. Mr. Rivera wanted her to see where he lived, so when she drove by she would know it was his house, Ms. Martinez says. He also knew that this would be the only time she visited. Although the woman was now interested in him, Mr. Rivera no longer wanted anything to do with her. Let’s move on, then, to the current love story. How did Mr. Rivera meet Ms. Martinez, who had come to Puerto Rico after a divorce to make a fresh start? She was out dancing with a group of friends, Ms. Martinez says. Their eyes met and they both froze. Later, he asked her to dance, but he was so shy he could barely look at her. When she left that night, he said, “Wait a minute,” and grabbed a napkin, twisting it into the shape of a rose. The talk turns back to the house. Mr. Rivera speaks of plans he had to abandon because they were too expensive (putting two small wrecked planes in the yard, so that they would look as if they had been downed by the spaceship), and those he still hopes to realize (installing a fog machine to make the house look as if it is levitating). But these things cost money. The house was recently featured in El Nuevo Dia, the local newspaper, and all the radio stations were talking about it, and the same day he went to the bank to check his balance and found he had only $20 in his checking account. Is there anything else Mr. Rivera would like people to know about his house? He has a whole list of people he would like to thank, Ms. Martinez says. Among the most important are his ex-wife, Carmen Gloria Santos, who lent him money to start building, and his brother Hector Luis Sanchez Rivera, who was his right-hand man during construction. Additional reporting was contributed by Diego Ribadeneira and Maria Newman. 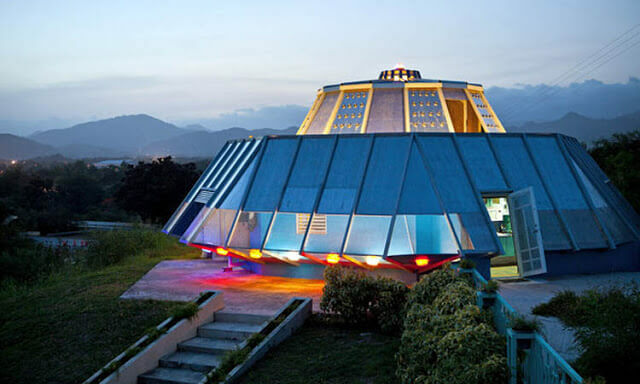 An article last Thursday about a house in Juana Diaz, P.R., that resembles a spaceship misstated the number of tones in the sequence from “Close Encounters of the Third Kind,” which the house emits. It has five tones, not four.